Dillon Kyle Gee (born April 28, 1986) is an American professional baseball pitcher who is a free agent. He has played in Major League Baseball (MLB) for the New York Mets and Kansas City Royals. Dillon Gee was born on April 28, 1986 in Cleburne, Texas, the second son of Kevin, a Fort Worth Fire Department fireman, and Kelly Gee. His brother Jared is five years his senior. Gee in played baseball at Cleburne High School in Cleburne. In his first start in his senior year, Gee pitched a no-hitter, falling one out short of a perfect game. He later threw a second no-hitter, finishing the year as the team's Most Valuable Player and earning first team all-state and all-district honors. As a batter, he hit .443 with six home runs and 46 RBI in his senior year. He also played for the school's golf team. In 2005, Gee attended the University of Texas at Arlington and played baseball for the Mavericks. At UT Arlington, Gee helped the Mavericks to a berth in the 2006 NCAA tournament. He ranks second on the school's career list with 298.1 innings pitched and was a two-time honorable mention All-Southland Conference recipient (2005 and 2006). Gee was drafted by the New York Mets in the 21st round of the Major League Baseball draft and began his professional career with the Class-A Brooklyn Cyclones of the New York–Penn League. He initially worked mostly out of the bullpen yet by season's end, Gee was starting and amassed a 3-1 record with a 2.28 ERA as a starter. In 2008, Gee had a break out year with the Class-A St. Lucie Mets of the Florida State League (FSL), winning the Sterling Award and being named to the FSL All-Star team. Later in 2008, Gee was promoted to the Class-AA Binghamton Mets of the Eastern League where he went 2-0 with a 1.33 ERA in 4 games. In 2009, Gee started the season with the Class-AAA Buffalo Bisons of the International League yet was shut down May 25 due to a torn labrum in his right shoulder. In 2010, Gee had a bounce back season and recouped his health after his season-ending injury in 2009. He went 13-8 for Buffalo, and led Class-AAA with 165 strikeouts in 161 1⁄3 innings, yet he gave up more than a hit per inning and finished with a 4.96 ERA. Nonetheless, Gee made his major league debut with the Mets on September 7, marking the first time in Mets history that two starting pitchers made their major league debuts in the same game, as Gee faced rookie Yunesky Maya of the Washington Nationals. Gee also became the first Mets pitcher to record an RBI in his major league debut. He pitched brilliantly in his debut, taking a no-hit bid into the 6th inning when Willie Harris broke it up with a lead off home run. He finished giving up only two hits and one run in seven innings. Gee stayed with Mets until the end of the season, compiling a 2-2 record with a 2.18 ERA in 5 starts. The Mets recalled Gee to the major leagues on April 17, from the Buffalo Bisons where he was 1-1 with a 4.63 ERA in 2 starts. Gee then went on to go 7-0 with a 2.86 ERA in his first nine games as a starting pitcher. Gee was off to the best start by a New York Mets rookie to open a season in franchise history, exceeding Jon Matlack's 6-0 start in 1972. He ended the season at 13-6 with a 4.43 ERA in 30 games. Gee broke camp with the Mets as their fifth starter. To begin the season, Gee had a rough stretch posting 5.65 ERA through his first seven starts. In that stretch, Gee surrendered a career high 12 hits in his start against the San Francisco Giants on April 23. Gee then went on to win 2 consecutive games against the Toronto Blue Jays and San Diego Padres, in the latter he posted a career-high 9 strikeouts over seven innings. On June 20, Gee matched his career high in strikeouts against the Baltimore Orioles and improved to 5-5 on the season. Gee ended the first half of the season at 6-7 with a 4.10 ERA in 17 starts and was scheduled to open the team's second half in Atlanta. But on July 10, Gee was indefinitely placed on the disabled list after a clot in the artery of his right shoulder was discovered. He decided to undergo surgery at Barnes-Jewish Hospital in St. Louis, to address the issue. The surgery shut him down for the rest of the season. He finished the season at 6-7 with a 4.10 ERA in 109 2⁄3 innings pitched with 97 strikeouts and 29 base on balls. On May 30, 2013, Gee recorded a career-high 12 strikeouts in a game which led to the Mets sweeping the Subway Series against the New York Yankees for the first time ever. On June 17, 2013, Gee hurled 8 1⁄3 shutout innings against the Atlanta Braves before allowing a 2-run walk-off home run to Freddie Freeman. After a horrible start to the season, Gee bounced back to become the team's second-best starter, behind Matt Harvey. Gee was the only member of the Mets' Opening Day rotation to last the entire season. In 32 starts in 2013, he went 12-11 with a 3.62 ERA and 16 quality starts, striking out 142 in 199 innings. Gee was named the Mets opening day starter at Citi Field for 2014. He had eight starts and went 3-1 with a 2.73 ERA, before being placed on the disabled list with a strained right latissimus dorsi on May 15. After 6 weeks on the disabled list, Gee made his first start on July 9 against the Braves at home going 7 innings and giving up 1 run on 6 hits to earn a win. During spring training, Gee was preparing to accept a role in the Mets bullpen when it was announced that starting pitcher Zack Wheeler would miss the entire 2015 season due to injury. Gee therefore began the 2015 season in the Mets starting rotation. On May 8, Gee was placed on the disabled list with a groin strain and was replaced in the rotation by top prospect Noah Syndergaard. He was eventually returned to the active roster on June 3, at which point the Mets announced plans to use a six-man starting rotation. However, after one poor start, the Mets announced plans to return Gee to the bullpen. A frustrated Gee told the media, "I’m almost at the point now where I just don’t even care anymore. I mean, I’m kind of just over it all." Gee was designated for assignment by the Mets on June 15. On June 21 Gee was sent to the Las Vegas 51s. On October 7, 2015, Gee opted out of his contract making him a free agent. In 2015, Gee went 0-3 in 8 games, seven of which he started with a 5.90 ERA. In the minors with the 51s, Gee went 8-3 with a 4.58 ERA in 14 starts. 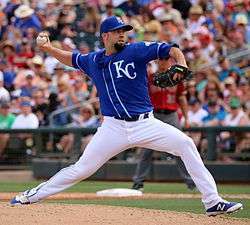 On December 14, 2015, Gee signed a minor league deal with the Kansas City Royals. Gee elected free agency after being outrighted on November 8, 2016. Dillon Gee was born to parents Kevin and Kelly Gee on April 28, 1986. Gee is married to Kari Ann and his hobbies include hunting and golf. On November 16, 2013, Dillon's wife gave birth to their 1st child Hudson Kyle. ↑ Ackert, Kristie (November 28, 2013). "Mets pitchers Dillon Gee and Bobby Parnell have special bond with FDNY families". New York Daily News. Retrieved 15 June 2015. ↑ Ackert, Kristie (April 3, 2013). 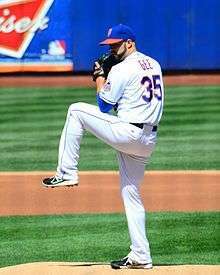 "NY Mets pitcher Dillon Gee able to put blood clot scare in perspective during brother's battle with leukemia". New York Daily News. Retrieved 15 June 2015. 1 2 3 4 5 6 "University of Texas at Arlington profile". University of Texas at Arlington. Retrieved 12 September 2010. 1 2 "Dillon Gee Stats, Bio, Photos, Highlights". mets.com. Retrieved 29 June 2011. ↑ "Dillon Gee Minor League Statistics & History". baseball-reference.com. Retrieved 29 June 2011. ↑ Costa, Brian (March 28, 2009). "Dillon Gee to start for New York Mets; Livan Hernandez to pitch in 'Timbuktu'". The Star-Ledger. Retrieved 6 September 2010. ↑ "Mets Top Prospects: #20 Dillon Gee". amazinavenue.com. Retrieved 29 June 2011. 1 2 Kaplan, Thomas (September 7, 2010). "Mets Call-Up Pitches Like Ace in Debut". New York Times. Retrieved September 8, 2010. 1 2 Rubin, Adam (September 6, 2010). "Gee, Maya will make Mets history". ESPN. Retrieved 6 September 2010. 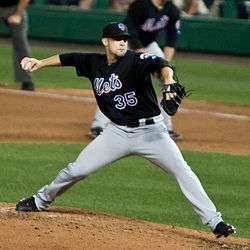 ↑ Mets recall RHP Gee, designate Misch, Canada.com, April 17, 2011. 1 2 Adam Rubin. "Gee's hot start part skill, part luck". espn.com. Retrieved 29 June 2011. ↑ "Amid Wright drama, Gee, Mets fall to Crew". Mets.com. Retrieved 16 May 2012. ↑ "Stellar Gee cruises as Mets step up with bats". Mets.com. Retrieved 26 May 2012. ↑ "Baltimore Orioles at New York Mets – June 20th, 2012". Mets.com. Retrieved 21 June 2012. ↑ "Clot in shoulder artery forces Gee to hospital". Mets.com. Retrieved 10 July 2012. ↑ "Source: Dillon Gee to have surgery". espn.com. Retrieved 12 July 2012. ↑ "Mets 101 Season in Review: Starting Pitching". ↑ "Mets place Gee on disabled list with lat strain". Mets.com. Retrieved 9 July 2014. ↑ "Gee sharp in return as Mets win fourth straight". Mets.com. Retrieved 10 July 2014. 1 2 Rohan, Tim (June 7, 2015). "Mets' Dillon Gee Unhappy With Move Back to the Bullpen". New York Times. Retrieved 15 June 2015. ↑ Vorkunov, Mike (May 8, 2015). "Mets put Dillon Gee on disabled list, call up Noah Syndergaard". NJ.com. Advance Digital. Retrieved 15 June 2015. ↑ "Mets designate right-hander Dillon Gee for assignment". ESPN.com. Associated Press. June 15, 2015. Retrieved June 17, 2015. ↑ "Mets' Dillon Gee officially becomes free agent". ESPN.com. Retrieved 7 October 2015. ↑ "Dillon Gee signs minor league deal with Kansas City Royals". ESPN.com. Retrieved 27 December 2015. ↑ Adams, Steve (November 8, 2016). "Dillon Gee Clears Waivers, Elects Free Agency". mlbtraderumors.com. Retrieved November 8, 2016. ↑ Mark Newman. "Gee shows at Fan Cave with shaved head". mets.com. Retrieved 29 June 2011. Wikimedia Commons has media related to Dillon Gee.